Shutdown polls: How markets and election fears are forcing Republicans to end the debt ceiling fight. If the debt ceiling fight ends soon, thank polls and markets for bringing pain to the GOP. 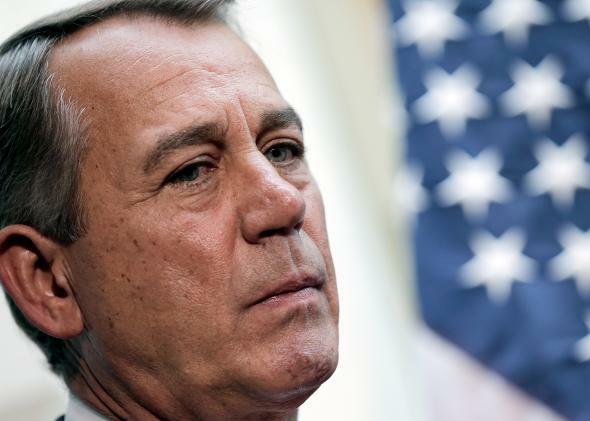 House Speaker John Boehner at a Republican press conference on raising the debt ceiling on Oct. 10, 2013. Two weeks into the federal shutdown, Congress is finally getting its act together. The House, Senate, and White House are exchanging offers and trying to head off default. Why? It isn’t because our leaders have bravely put aside gamesmanship to do what’s right for the country. It isn’t even the Thursday deadline, which almost everyone acknowledges is conservative guesswork. The reason we’re finally moving is that polls and markets, looking ahead to default and to next year’s elections, are translating those perils into immediate pain. Polls and financial markets get a bad rap. We criticize them as too fast, too superficial, too driven by short-term thinking. Polls make politicians focus too much on re-election and too little on doing the right thing. Hyperactive traders with clever financial instruments create bubbles and financial crises, including the recession from which we’re recovering. We want our politicians to think more like leaders. We belittle derivatives and pledge to rebuild real, solid industries, especially manufacturing. But polls and markets serve a vital function. They’re our political and economic nervous system. They anticipate the damage caused by our behavior and turn it into an immediate problem. They make it hurt. House Republicans began this shutdown bold and confident. They thought that Obamacare was a disaster, that the public was on their side, and that the president would cut a deal. But President Obama and the Democrats held firm, and polls turned against the GOP. The first-week surveys, released by CBS News and Gallup, were bad for Republicans. The second-week polls were worse. In Pew and ABC News/Washington Post samples, congressional Republicans scored about 10 points worse than congressional Democrats and about 20 points worse than President Obama. The Democrats’ numbers were improving, but the GOP’s were deteriorating. A United Technologies/National Journal poll found that on the question being pressed by the GOP—whether Congress should fund the government only if Obama agreed to delay or drop his health care program—the Republican position, already trailing 2–1, was continuing to bleed support. On Wednesday, Gallup reported that the GOP’s favorable rating had plummeted to 28 points—an all-time low for either party. On Thursday, an NBC News/Wall Street Journal poll confirmed the record low, this time showing only 24 percent favorable. Again, Democrats and Obama led the GOP in favorability and other measures by about 10 and 20 points, respectively. Republican pollster Bill McInturff called it one of the most significant surveys he had ever seen. “If there is a break, there is a break against the Republican position,” he told NBC. Even Sen. Ted Cruz, who commissioned his own poll and tried to spin it at a Republican lunch meeting, couldn’t hide the bad numbers. Meanwhile, the markets moved. In the shutdown’s first week, investors shrugged off the shutdown, assuming Congress would end it soon. But by the second week, money-market funds were selling off their Treasury bills. Investors fled the short-term U.S. debt market, forcing the government to pay the highest rate of return it had offered since the 2008 financial crisis. The Dow fell for the 11th time in 14 days. Major employers urged their workers to call their congressmen and demand an end to the standoff. The U.S. Chamber of Commerce, the National Retail Federation, and other business groups began to warn publicly that they would target the obstructionist Republicans in next year’s elections. The GOP’s defiance collapsed. House Republicans ditched the Obamacare fight and shifted their aim to long-term talks on entitlements and tax reform. They offered a clean proposal to raise the debt ceiling, only to be quickly overtaken. Senate Republicans told House Speaker John Boehner that if he didn’t reopen the government as well, they’d cut the deal themselves. Now the party’s two caucuses—House and Senate—are competing to satisfy the Democrats, reassure the markets, and end the pain. Thank you, traders. Thank you, polls. You saved us from burning ourselves, by bringing the pain to our fingers before we reached all the way into the fire. Maybe this time we’ll learn our lesson. If not, we’ll need you again. Read more of Slate’s coverage on the debt ceiling.